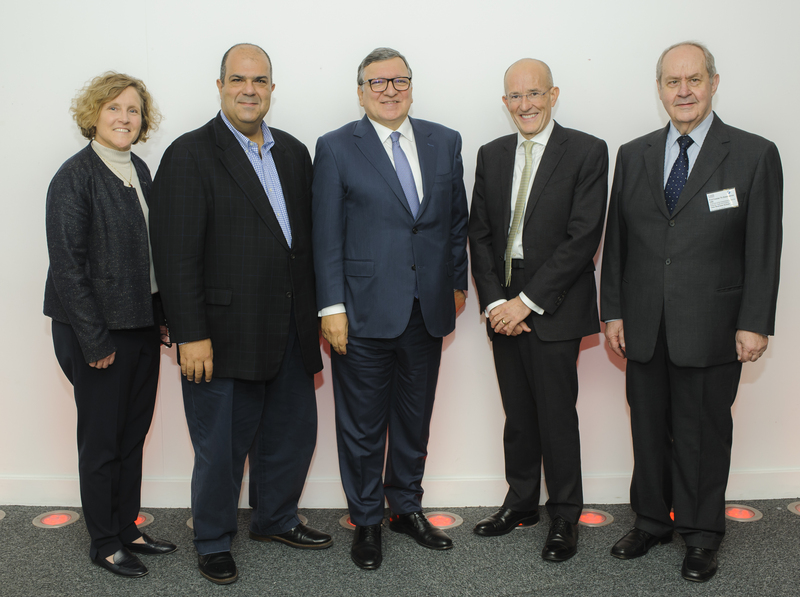 The former European Commission President and Prime Minister of Portugal José Manuel Barroso delivered the Mais Lecture at Cass Business School on Monday 29th October. Mr Barroso’s speech was entitled The European Union and the Changing International Landscape. Mr Barroso discussed the geopolitical challenges and opportunities facing the EU and the world including transatlantic relations, the influence of China, immigration and Brexit and considered their impact on local and global economies. The speech was followed by a Q&A with Professor Paolo Volpin, Vice-Dean of Cass Business School, which covered Mr Barroso’s wide-ranging career and his hopes for the future of the European Union after the UK leaves in March. It is an honour to deliver this year’s Mais Lecture, on a topic very dear to me. While there are many uncertainties, the European Union is resilient and I personally remain confident in the future of the EU and the relationship with the UK. We’re currently witnessing a period of important changes and reactions to the evolving global landscape, which I feel will drive an even more interconnected world. Professor Sir Paul Curran, President, City, University of London, delivered the official welcome to Mr Barroso. Speaking at the event, Professor Marianne Lewis, Dean of Cass Business School, said she was pleased to welcome Mr Barroso to deliver the 31st Mais Lecture at Cass. “Since its inception in 1978, the Mais Lecture a long list of acclaimed speakers to deliver the Lecture including all the previous Governors of the Bank of England, Chancellors of the Exchequer, future Prime Ministers, a Nobel Prize Winner and Heads of the International Monetary Fund, the Federal Reserve and the Bundesbank. José Manuel is chairman and non-executive director of Goldman Sachs International and an advisor to the firm. He joined Goldman Sachs in London in 2016 after an established career in EU and Portuguese politics. José Manuel served as Prime Minister of Portugal from 2002 to 2004 and then as President of the European Commission from 2004 to 2014. During his two terms at the Commission José Manuel played an influential role in the passing of the Treaty of Lisbon, responding to the financial crisis and incorporating new members in the European Union, as the EU went from 15 to 28 countries between 2004 and 2014. On behalf of the EU, José Manuel received the Nobel Peace Prize in 2012 and gave the acceptance speech together with the President of the European Council. He has been awarded numerous honorary degrees and has received more than 60 decorations, prizes and honours. Find out more about Cass events here.